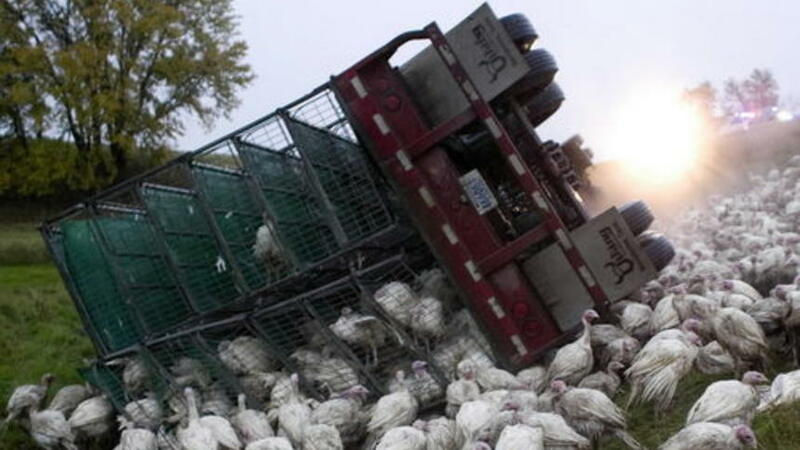 On October 10, 2008 the driver of a turkey truck in Rollag, MN unfortunately died when his truck rolled down an embankment. Hundreds of turkeys were on the loose. I-79 in Pennsylvania, in July 2005. 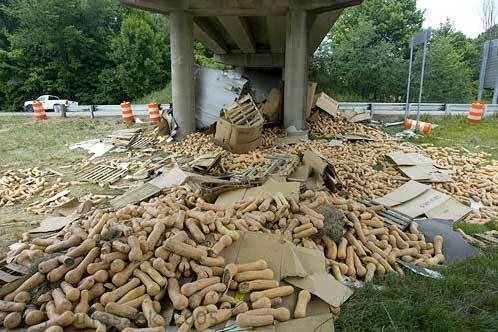 Apparently, a tractor-trailer hit the overpass support, spilling it’s squashed squash on the median. I can’t find a description of what happened here. 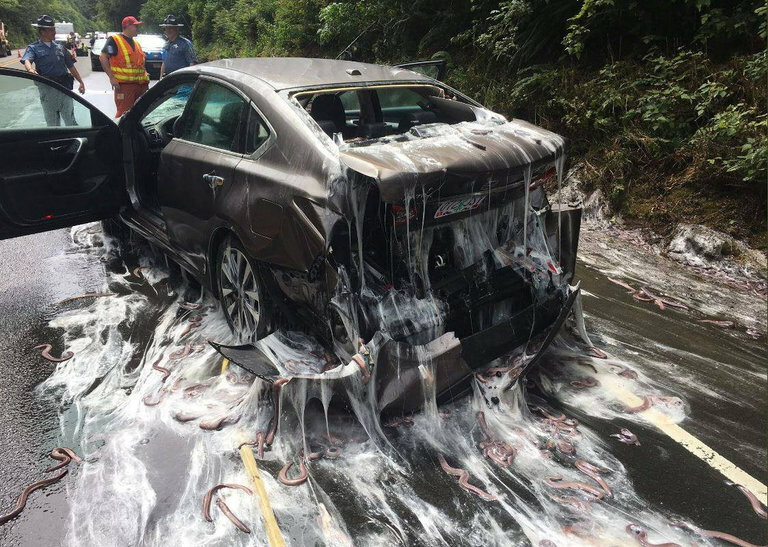 Obviously the driver decided to stop a little too quickly. If you’re carrying a giant hunk of concrete in the back of your truck, I would think you’d want to drive somewhat carefully. 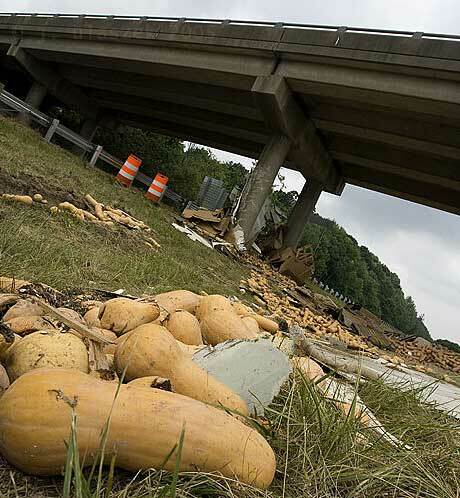 My question is “how did they get that big block of concrete in the truck in the first place?” My next question is “why would you want to truck around a giant hunk of concrete?” Does this still qualify as a spill? It just came out the wrong end. Scroll down for further information on this incident! This photo has caused a bit of controversy (although not quite as much as the Beer Spill. Visitors have said that it is not concrete, but rather, Stone, Limestone, Marble, or Granite. Christian M. even sent a link showing similar blocks of marble being trucked. The only thing I can say with certainty is that the original source said that it was concrete. My vote is for Limestone. One visitor tells me that they use a giant forklift to get them into the truck. Very cool! And John M. gave this some serious thought. “Much more likely to be marble then limestone. Marble is shipped in blocks for sculptures or for further processing – cutting into sheets and polishing. Marble also has a low friction factor, so would slide under moderate braking. Also the low friction would make it “easy” to push the block into the container. 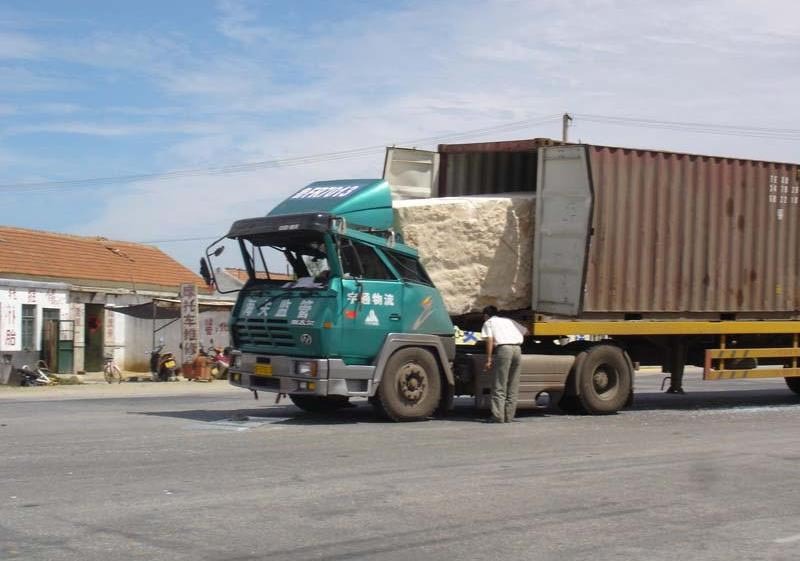 In Asian countries serious overloading is a part of life – partly helped by low speeds which means tyres will not blow out as readily because less heat is built up in them. Normally of course containers are loaded with the doors to the rear to facilitate unloading – why this is back the front is a mystery unless that was the only way they could spread the load the way they needed. 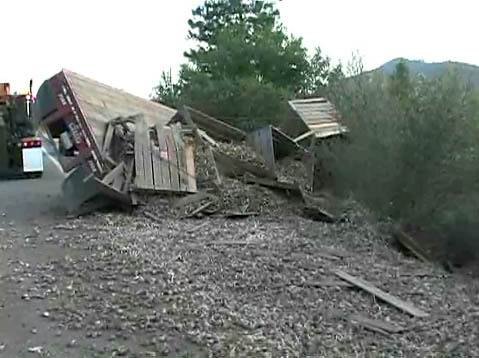 In any case the block was obviously not restrained to any degree, so under braking it slid forward, the impact load on the doors caused them to burst open, and it slid out until stopped by the cabin. 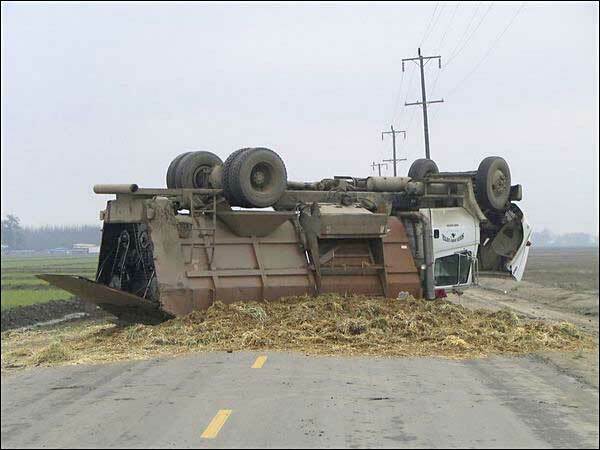 On February 1, 2008, a truck carrying silage overturned on a road near Tulare, CA. For those who aren’t sure what silage is, (this included me until I looked it up) it is fermented, high-moisture fodder that can be fed to ruminants (cows and sheep) or used as a biofuel feedstock for anaerobic digesters. It’s usually made from grass crops such as maize or sorghum. Sometimes it’s a mix of two crops. Reportedly, a small car crossed into the truck’s lane and the driver drove onto the shoulder to avoid the car, causing him to lose control. The driver suffered some injuries and was transported to the hospital. More info on Silage from Stacey S.
Stacey wasn’t specific about the “distinctive smell” but I’m going to jump to the conclusion that it isn’t pleasant. 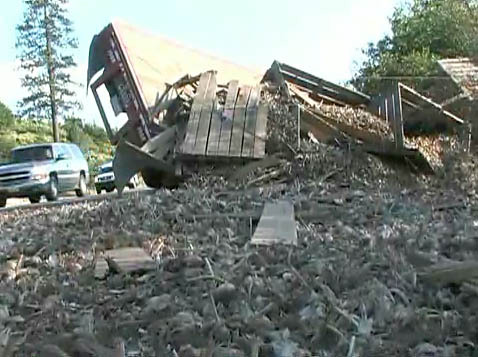 A tractor-trailer loaded with peanuts overturned on Sept. 27, 2005 in North Carolina. 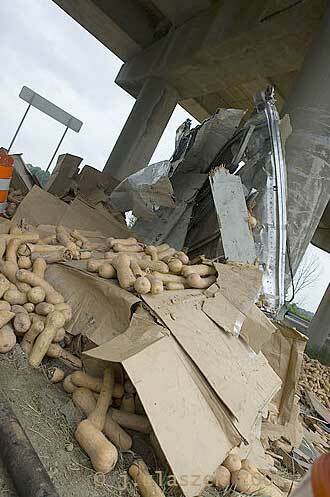 It took firefighters about three hours to clear the spilled peanuts from the US70 and US117 intersection. 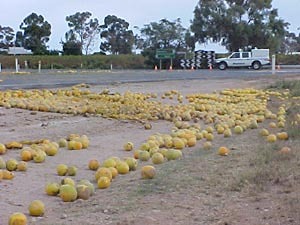 On April 8, 2003, a semi trailer lost it’s load on the Sturt Highway (not sure where this is) when a rope snapped. 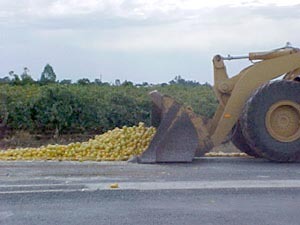 53 bins, totaling 26 1/2 tons of oranges covered the road. “The Sturt Highway (named after an early explorer) runs through Mildura in the heart of South Eastern Australia’s citrus growing area, on the Murray river. 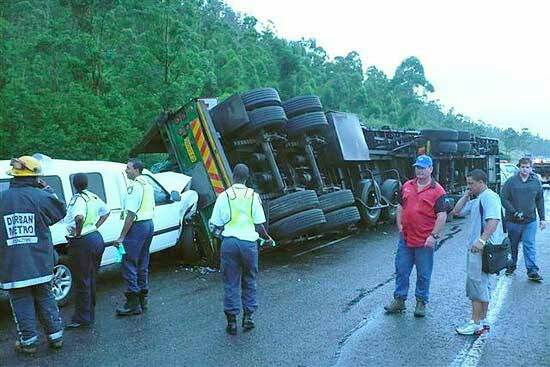 On February 8th, 2008, on the N3 in Durban (which is, I think, in South Africa) A truck had a blow-out, which caused it to slide in the wet conditions, colliding into a guardrail and overturning. 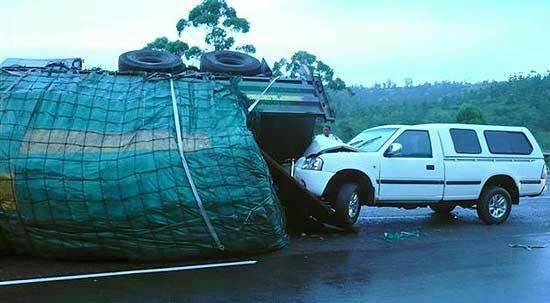 The news report says that a “bakkie” then collided with the truck. Apparently, a “bakkie” is slang in South Africa for a small pickup truck. It’s also the name of a small bowl to put something in, which would explain the nickname. 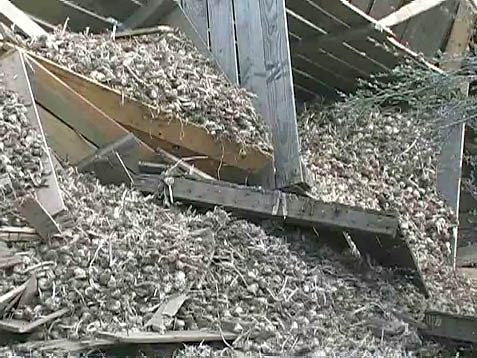 Nobody was hurt, but cleanup crews cried for hours. Just kidding. 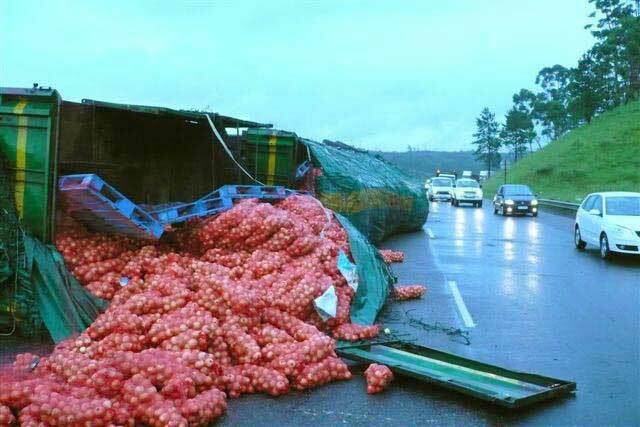 It’s an onion joke. 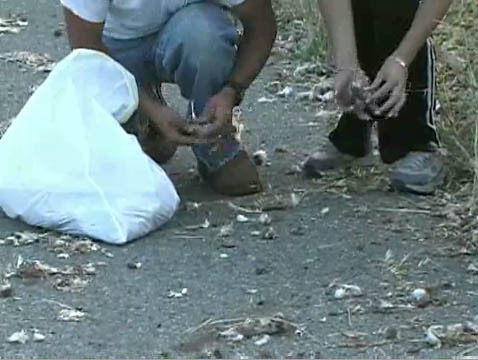 On August 7, 2006, a trailer full of garlic overturned along Highway 299 in Montgomery Creek, CA. 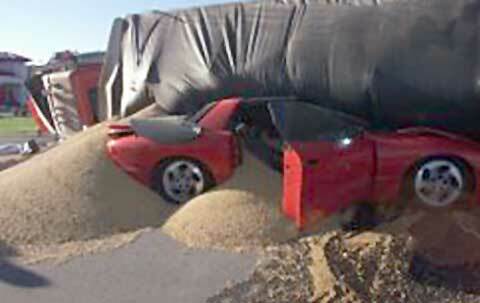 A truck hauling 50,000 pounds of soybeans overturned and dumped them into a 1995 Firebird in Clarksville,TN. 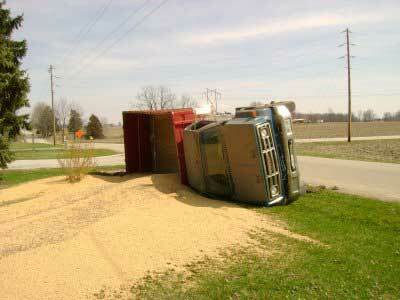 A grain truck had overturned in their front yard spilling its load of soy beans. The driver was a little dazed, but not injured. Within minutes, the police and a tow truck were called to the scene. 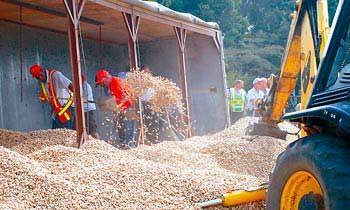 Later, a crop vacuum came by and cleaned up the soy beans.